In 1975, Anne Willan, a culinary icon who, along with Julia Child, Jacque Pepin, James Beard, and others, launched the modern culinary industry, founded École de Cuisine La Varenne in Paris and educated some of today’s most notable chefs – among them Steve Raichlen, Gale Gand, Virgina Willis, Martha Holmberg, and Alexandra Guarnaschelli. Upon enrolling at La Varenne, all students received a helpful and easy reference tool: La Varenne Basic Recipes. The booklet was based on chef Albert Jorant’s belief that “there are only fifty basic recipes in the culinary repertoire, and all other dishes can be made from them.” Edited by Anne Willan, La Varenne Basic Recipes was fifty-five staple bound pages with a card stock cover and it was a treasure-trove of essential recipes for any aspiring chef. The recipes included: • Stocks - 10 recipes: including Veal, Chicken, Fish and Glazes • Sauces - 17 recipes: from Brown to Béchamel to Hollandaise and Mayonnaise • Pastry and Cakes - 8 recipes including Pie, Sweet, Choux & Puff Pastry as well as Sponge Cake • Creams and Icings - 7 recipes including Butter Cream Frosting and Pastry Cream • Meringues - 3 recipes • Desserts and Cooking Sugar - 6 recipes including Ice Cream plus a Sugar Cooking Chart. 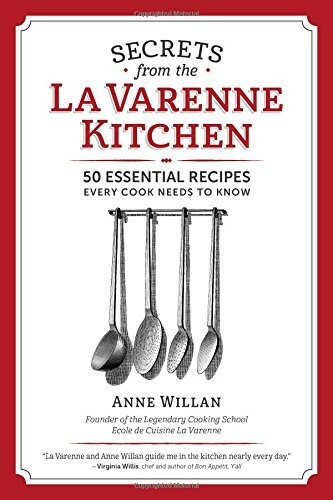 Now, for the first time, the 50 essential recipes from the La Varenne curriculum are available to chefs, culinary students, and passionate cooking enthusiasts in Secrets of The La Varenne Kitchen. (It is important to note that this is not a book of finished dishes, though some recipes such as sherbet are complete in themselves. Rather it is a collection of the sauces, pastries and creams that go to make up a dish.) Above all, Secrets of the La Varenne Kitchen is a working tool, to fashion professional excellence. It is a practical book for practical cooks – both professional and home enthusiasts.